Thank you for welcoming my friend, Ane Mulligan last month. You guys are awesome! She’s a great gal and an awesome writer. I will say that 2018 has already had its highs and lows for me. 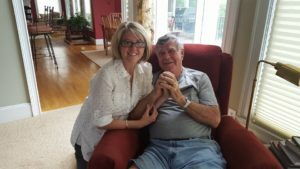 My father, who had cancer, passed away on Valentine’s Day. I’m glad he’s not consumed with that disease any more, but the heart ache of missing him is real and daunting at times. We live in Georgia and he was buried in northern Ohio, so the family flew up there for the funeral the week after he passed away. When we returned home I had 10 days before a left on a trip that had been planned for months. My dad’s passing, low point. I don’t have the words to describe Israel. It literally changed my life. My absolute favorite place we went was the Temple Mount. This picture is taken from the Temple Mount and that is the East Gate. We worshipped on Mr. Arbel where Jesus would retreat to pray–the Sea of Galilee is in the background. I wasn’t sure whether to go so soon after my father’s passing, but my husband told me it would be good. I had time to think, process, pray, cry and experience all the other emotions that come with a life change. I did take my computer, but I didn’t use it. I didn’t write, but I did feel. I did experience. I was refreshed in SO MANY WAYS. There were God stories that have impacted my life as well while we were there. My heart needed an uplift, and the trip certainly did that, and more. I mean, who wouldn’t be uplifted by riding a camel. So, it’s back to real life, now. The day job, the books to be written. I know I’m a different person than I was when 2018 rang its way into being. And that’s okay. I’d like to do a giveaway today. This is my Single Dad Next Door Collection. 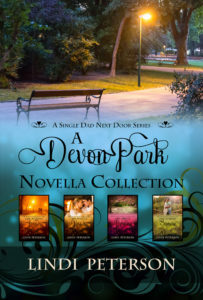 4 novellas, 1 town. I’ll choose a winner from the commenters. Hi Lindi! My condolences to the passing of your father. So glad you listened to your husband and took the trip to Israel to cry, refresh and recharge. The ache of missing your father will lighten over the years; the memories remain. By dad passed 4 years ago a week before my birthday. Delightful photos of Israel, especially the camel ones. Thanks for sharing and best wishes. Happy Monday. Renate—Thank you. I’m sorry about your father’s passing. And so close to your birthday. Happy Monday to you, too! I am reading Flying by Night by Rebecca L Brown. I am enjoying it because the child character in the book is autistic and I have an adult son with autism. It’s interesting to read how the mother in the book is dealing with it. I haven’t heard of this book. Have you read McCall Hoyle’s The Thing with Feathers? A great YA book dealing with a girl who has epilepsy. Flying by Night sounds interesting. :) Let us know how it turns out. I’m so sorry to hear about the passing of your dad. Big, big hugs to you! It’ll be seven years in November since I lost my dad, and I can still remember how difficult that first year, especially, was. My thoughts and prayers are with you and your family. I’m glad you got to go to Israel. It sounds like such an amazing experience. The photos you shared are beautiful, and I think the timing probably was perfect after everything you’ve been through. Thank you so much for sharing your highs and lows for the year. Many prayers for blessings for you all! Hi Lindi, so sad to hear about your dad. Praise God for memories:) Wow, Israel- that is on my list of dream places to visit. Thanks for sharing your photos. I have read a lot of books this year and have enjoyed them all- too many to write about!! Wemble—Visit Israel if you can. You will always be glad you did. I’m glad you are reading many books. I love that. Sometimes I wish I had days on end just to read. I would be very happy doing that! Hello. I lost my dad to cancer 4 years ago, I truly sympathize with you. I also went to Israel 3 years ago with Inspiration Tours. I also rode the camel at the gas station. LOL. Visiting Israel the feelings are indescribable. I just finished reading an ARC of Storm Front by Susan May Warren, and starting Lone Witness by Rachel Dylan. Any books by these ladies are recommended. HI Shadowblossom—I’m sorry to hear about your father’s passing–and cancer, too…..it’s terrible. And yay for riding the camel at the gas station! It was truly amazing. And yes, the feelings are indescribable. Do you have a desire to go back? Thank you for the book recommendations. I haven’t read anything from Rachel Dylan. I’ll have to check her out. I am happy you were able to refocus and recharge inspire of the loss. I am sure your dad was look down down and smiling because you chose to visit a sacred place. You will have moments of tears but that’s ok and the memories you have of your dad is priceless. Lindi, I am so very sorry for the passing of your father, my prayers to your family. My husband (also from Georgia – go Dawgs!) was in the Navy for 10 years and went to many many places over those years. He says that Israel was by far his most favorite and powerful place he has ever visited! I am so glad you were able to enjoy your trip with all that was happening! Hi Paula–Thank your husband for his service in the Navy. Powerful–that’s the word for Israel—I read they had major flooding a few days ago….some students training for the military were killed in the flooding. Keeping them in prayer…Israel and the families. Thank you for the wishes to my hubby, I will pass them along! I am sorry to hear about that tragedy, I will certainly keep them in my prayers as well! Hugs, Lindi! God is so good, the ways He brings us healing. I’m sorry about your dad, Lindi. Sorry to hear about your Dad. My Mother passed away in February at 101 years old. Daddy was ten years ago. The trip to Israel sounds super. Would love to go some day. I just finished The Accidental Guardian by Mary Connealy. Great book! I have read some very good books this year. Two favorites are The Sea Before Us by Sarah Sundin and Winning Miss Winthrop by Carolyn Miller. There are such good ones out there this year! Paula–Hi! Wow–101! That’s awesome–what a long, good life. :) Go to Israel if you get the opportunity. That’s what we’ve been telling people. :) Thank you for the book recommendations. I NEED to read something by Sarah Sundin!! I am so sorry about your dad. I am going through that with my dad right now. every day seems a little worse. So happy about you going to Israel. So cool. I have a friend that is getting ready to go right now. If I could i would go with her. Have a blessed week and keep your sights on Him. so sorry to hear of your dad’s passing! Praying for God’s comfort for you and the family! I’m so sorry about your father. It is very hard to get used to, missing our loved ones. I am so happy you went on your trip! I have been blessed to go to Israel twice now and each time was life changing. Your pictures make me smile as I relive those moments all over again. So sorry to hear about your dad, but am glad you got to go to Israel. I remember back when my grandfather passed away in early December, and my family went to Hawaii right after Christmas. It was so refreshing to be away from “normal” and have time to relax and process. I volunteer in the church library and have for almost 40 years. We have books for all ages from 0-100. The library is 75 years young. I’m there 3 days a week, sometimes more. This is the good part of 2018. The bad part is I have been suffering with asthmatic bronchitis off and on since January 2018. I rang in the New Year with it and it’s been with me ever since. Janet–I can imagine you loving volunteering in the library–what a blessing they have in you—someone who loves to read. :) I’m sorry you’ve been having health issues….rest, rest. I find that is so important to staying well. I pray you get better soon!! Sorry for your loss. Both of my parents are gone, so I know that kind of loss. But that trip to Israel sounds wonderful for you. I don’t travel that much anymore, but I’ve heard some great stories from those who have traveled there. Sounds like it was good for you. You never know when God starts to heal our spirit. Thanks for this opportunity. Nancy, so true. I know God is working on healing my spirit. The “Israel” feeling has left me and I pray it won’t. So thankful that our God carries you through your sorrows and also gives you joy at the perfect time. MHSJ–Yes, He does. Great, amazing God. With His amazing grace. I’m so sorry about your dad. That’s something I’ve yet to experience though it’s probably getting close. Dad is 89 and seems frailer every time I see him. Mom’s been gone about 2 and a half years. Her birthday was Saturday (my daughter’s too) so I was really missing her. Even when we know it’s coming, and they are so much better off in heaven, it’s still hard on us. I’m glad you were able to go to Israel. Everyone I know who has gone has said it is a wonderful experience. Thanks for giving away a book of your novellas. I’m sure birthdays are hard. My dad’s is coming up in June. And father’s day. Already thinking ahead, but not borrowing trouble. :) And yes, heaven is better, but you’re right, we’re sad here. My deepest sympathy for the loss of your dad. I would love to go to Israel. I enjoyed your pictures. Lucy–Thank you! And yes, to Israel. :) A must! It’s tough losing a parent – I also lost my dad to cancer in 2002. I lost my mom to dementia on June 24, 2015. The funeral was on June 28 and on the 29th I left on a missions trip with my daughter to Paraguay. We hardly had time to grieve and yet the trip had been planned almost a year earlier. There’s nothing like a Daddy, Lindi. I’m glad you found healing on your trip. Shannon—:) That about says it all, doesn’t it? I just recently finished Francine Rivers ” The masterpiece”, and I really enjoyed it. Thanks for the giveaway.